The Overdrive reunion seems to be an ongoing concern. And that’s a good thing. “Let The Metal Do The Talking” was a great album, and “Angelmaker” continues in the same vein. Solid, traditional heavy metal. Not power metal, not neoclassical, not medievalinspiredprogfolkspeed metal. HEAVY METAL!! Opening track “Signs All Over” is a plain kick in the teeth. Or what to think of Frieda’s “There’s Something Going On”, which is turned into a heavy bruiser. Not quite as extreme as Nevermore’s take on “Sound Of Silence” but equally crafty. “Under The Influence” owes more than a little to Iron Maiden’s glory years. Album closer “The Wavebreaker” runs an epic 10 minutes and is the most European sounding track on the CD. 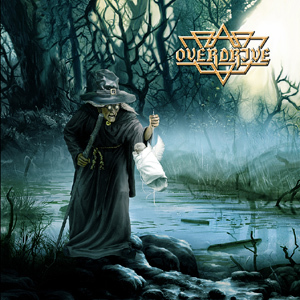 Overdrive’s brand of metal is refreshingly uncontrived. The band steers clear of banal chant-along choruses and doesn’t rely on triggered bass drums to create an impression of heaviness or urgency. Rather, they deliver finely crafted songs that rely on strong melodies, powerful riffing and spot on leads. This album will take you back in time without even trying to be retro. A killer heavy metal album. This may well be Overdrive’s strongest release so far. This entry was posted in Reviews and tagged Accept, Angelmaker, Iron Maiden, Janne Stark, Overdrive, review, Scorpions. Bookmark the permalink. A new Iron Maiden album. In the eighties that meant weeks of anticipation, and a near religious experience when I finally put the album on the turntable. Iron Maiden was synonymous to heavy metal as far as I was concerned. Those days are long gone unfortunately. Maiden toppled from their peak through a succession of ever more mediocre or downright appalling albums. This new album is touted as a step in a more progressive direction. The same was said about the atrocious A Matter Of Life And Death, so it was with trepidation I approached this newest epic. I’m glad to report that this time they’ve taken the progressive approach and made it stick. Instead of the endless intros (even if there’s still a more than healthy helping of them) and ad nauseam repetition that have marred most Maiden albums since Brave New World, the band offers up more intricate song structures and some more complex ideas. 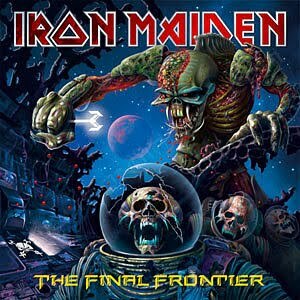 Title track “The Final Frontier” is a typical 21st century Maiden track. Including a chorus that is little more than repeating the title…“El Dorado” reminds me of the Powerslave era for some reason. “Mother Of Mercy” has Bruce straining in the chorus, but is a very well crafted song that builds to a nice climax. “Coming Home” sees the band branching out even more. An epic track with Bruce in fine form. Call me crazy, but “The Alchemist” has a whiff of “Spotlight Kid” about it. “Isle Of Avalon” is as epic as the title would have you believe. “Starblind” is a good example of the more proggy tendencies. A complex rhythm and no discernible chorus add up to a refreshing tune that brings something new to the Maiden catalog. By the time we reach “The Talisman” I’ve had my fill of intros. A more immediate song would have helped break up the monotony, which does begin to rear its head around this point. Once the song gets going things take a turn for the better. “The Man Who Would Be King” is a killer track where all the elements come together to near perfection. A track too many? “Where The Wild Wind Blows” offers yet another lengthy intro and may well be the least convincing track of the album. It’s not bad in itself, but it’s one in a series of three fairly similar tracks. Yes, another case of me bitching about an album being too long. Without “The Talisman” and “When The Wild Wind Blows” or even one of them this would have been a more balanced album. This is their first album in twenty years I’ve truly enjoyed. Even with most songs clocking in at over 7 minutes there are few dead spots and really no cause for boredom, even if it gets a bit samey towards the end. 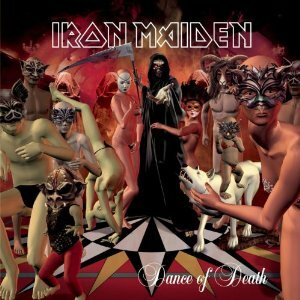 It has restored my belief in Maiden and the human race. Review by Stranger In A Belgian Land Sancho. This entry was posted in Reviews and tagged Adrian Smith, Brave New World, Final Frontier, Iron Maiden, Kevin Shirley, Martin Birch, Nicko McBrain, Steve Harris. Bookmark the permalink.